10 Differentiated English is one option to fulfill the sophomore English requirement at Norris High School, the other option being regular 10 English. We cover basic high school English skills including narrative and persuasive writing, grammar and usage, high level vocabulary, modern and “classic” fiction, non-fiction, and poetry. The current course includes the following books and authors: Into the Wild by Jon Krakauer, Much Ado About Nothing by William Shakespeare, The Things They Carried by Tim O’Brien, The Kite Runner by Khaled Hosseini, Of Mice and Men by John Steinbeck, Animal Farm by George Orwell, The Call of the Wild by Jack London, The Pearl by John Steinbeck, and The Hound of the Baskervilles by Arthur Conan Doyle. The basic difference between 10 English and 10 Diff English at Norris is the speed of the class. 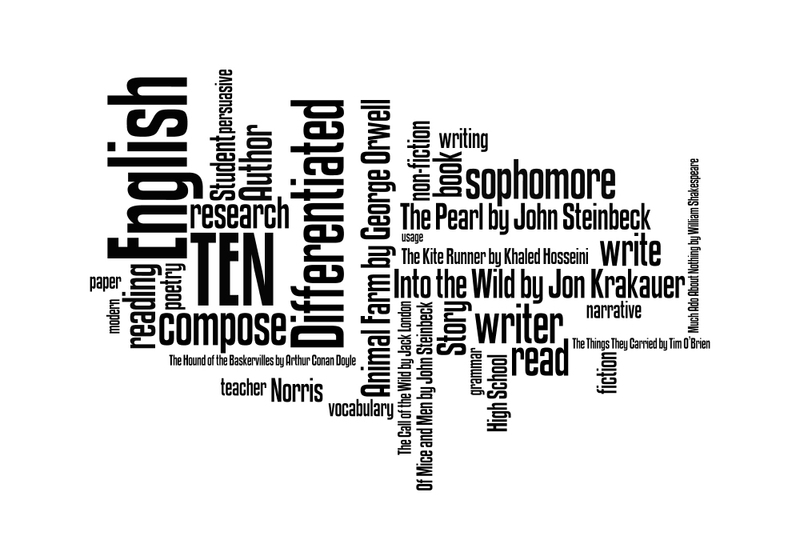 Generally, 10 Diff students read about twice the amount that 10 English students read.